A new report endorsed by Surfers Against Sewage estimates that the UK population throws away over 295 BILLION pieces of plastic every year. Piled together, this would create a mountain of plastic as high as The Shard in London with a base over a kilometre in diameter. In a unique personal experiment, Daniel Webb decided to store all the plastic waste he threw in the bin for 12 months. Shortly after moving to Margate on the Kent coast in 2016, he quickly learned that he was not provided with a recycling service at his flat. Motivated by plastic pollution and wanting to dig deeper into murky national recycling figures, he launched a personal investigation to understand exactly what he throws away and where it ends up. His hoard of plastic waste over a year totalled 4,490 individual pieces of plastic, which turns out to be slightly below the average UK citizen. 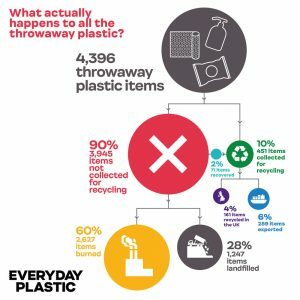 This new report ​‘Everyday Plastic: what we throw away and where it goes ‘ rigorously examines Webb’s annual consumption of plastic. It uncovers a wide range of brand new statistics, from the amount of food packaging used in a year to how much of Webb’s plastic waste is exported to other countries. One of the key aims was to authentically calculate the recyclability of his plastic waste.​ Daniel Webb​​ said: “Recycling is our way of doing good, right? While recycling allows us to obliviously get rid of our plastic waste, it far from gets rid of the problem. 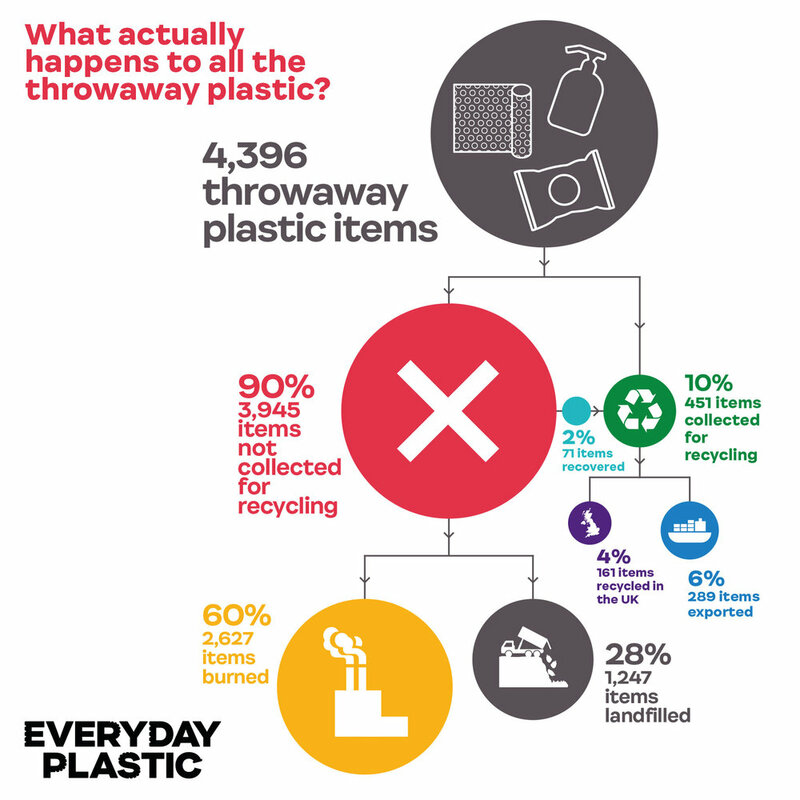 Illustrated by the fact that only 4% of my plastic waste would actually be recycled, it outs plastic recycling in the UK as a poorly funded system that needs significant investment and improvement. There is a major gap between our expectations and reality. Essentially, we not are being told the truth about recycling”. Webb and Schneider’s report follows separate research by the National Audit Office that earlier in the year revealed stark statistics about the reliance on export in the plastic recycling in the UK.​​ It also follows news reports last week that revealed fraud and exploitation in the recycling industry. 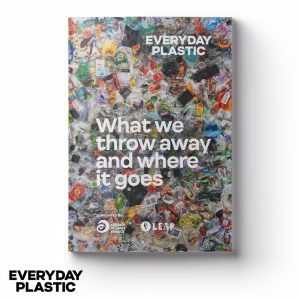 Everyday Plastic Everyday Plastic is an art and educational project that aims to communicate the realities of our plastic consumption in a personal and relatable way. Daniel Webb collected every piece of plastic he used in 2017. Having counted, categorised, weighed and photographed the whole collection of plastic waste, he turned it into a large-scale billboard, shown at Dreamland, Margate in early 2018. The project received global media coverage including features in The Guardian, National Geographic, Metro, Sky News, BBC and more. Daniel Webb Daniel has worked in marketing for 10 years. He has had a more active interest in conservation since 2015, leading him to launch Everyday Plastic in 2017. Daniel delivers talks to schools, businesses and events and works with major environmental charities such as Greenpeace, Friends of the Earth and Surfers Against Sewage. Dr Julie Schneider Julie has a PhD in earth sciences with a speciality in geochemistry and was a lecturer and researcher at the Université Nice-Sophia Antipolis in France for eight years. Since moving to the UK, she volunteered with Friends of the Earth before starting working with CHEM Trust – a charity that works to prevent man-made chemicals from causing long term damage to wildlife and humans. Footnotes 1 ​​All percentages are given relatively to the number of pieces. 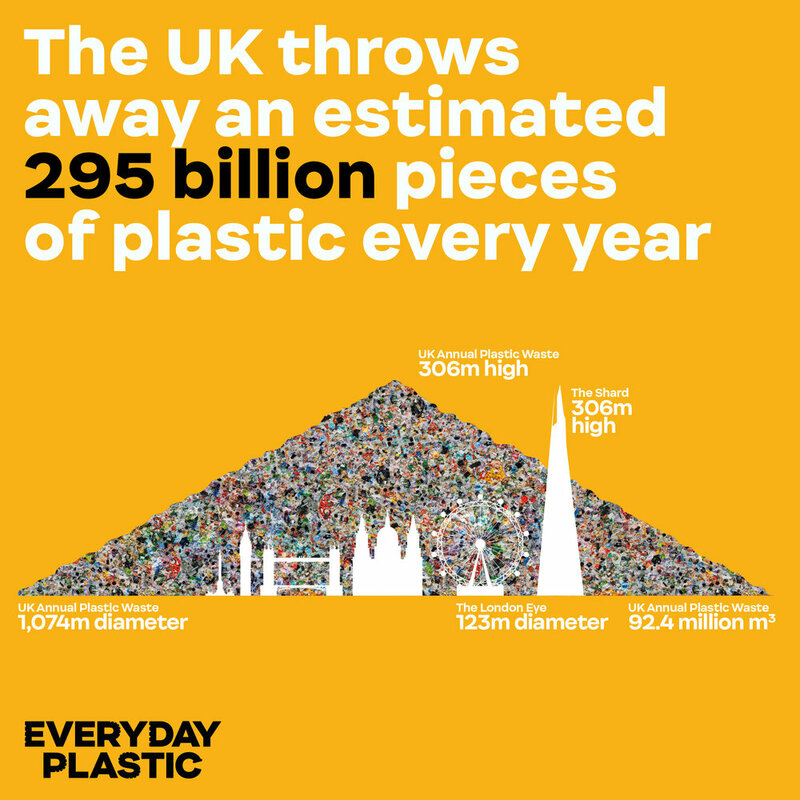 Data based on weight are available in the Annex 2 of the report at this link: everydayplastic.org/report-appendix 2​ National Audit Office, 23 July 2018. The packaging recycling obligations.